A Bronze Age cremation burial has been discovered near Stonehenge after being accidentally dug up by a badger. Objects found in a burial mound at Netheravon, Wiltshire, include a bronze saw, an archer’s wrist guard, a copper chisel and cremated human remains. Experts believe the burial may have been that of an archer or a person who made archery equipment. The artefacts date back to 2,200-2,000BC, senior archaeologist Richard Osgood, of the MOD, said. The burial mound, about five miles north of Stonehenge, lies on MOD land. Mr Osgood, from the MOD’s Defence Infrastructure Organisation, said it was “an exciting find”. “It was utterly unexpected. These are wonderful artefacts from the early Bronze Age, about 2,200-2,000 BC,” he said. Also among the finds were shaft straighteners for straightening arrows, and pieces of pottery. Mr Osgood said the badger had dug out the cremation urn and sherds of pottery were lying on the surface when they were spotted. A full archaeological dig was then carried out on the site. Mr Osgood said: “There are badger setts in quite a few scheduled monuments – the actions of burrowing animals is one of the biggest risks to archaeology in Britain – but to bring out items of this quality from one hole is unusual. Injured military personnel and veterans helped to excavate the site. The items are due to be put on display at Wiltshire Museum in Devizes later this year. 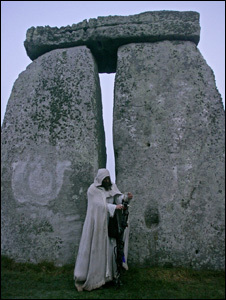 We offer archeological tours of Stonehenge and the ancient Landscape. Join one of our experts and learn more about recent discoveries.